This is the only 1968 car on this site. It is here because it is a distant cousin of the Talladega extended family. It is the same body style as the 1969 Spoilers and Color Code cars and it also has some NASCAR roots. It is also very rare. The information on this page regarding the 1968 Mercury Cyclone GT 500 was obtained from a variety of sources and interviews. Unfortunately, there is little available published factual information. What we have presented is what we believe to be true from the information we have been able to assemble. If you have relevant personal knowledge or information regarding these cars we welcome its submission. We will attempt to update this page on a regular basis as we obtain new relevant information. Send your comments, questions or information to Richard@TalladegaSpoilerRegistry.com. Click Here to read our most recent two Posts that fill in most of the missing information. Update 1 and Update 2. Click Here to visit our newest unknown, a Green “possible” GT 500. Look it over and tells what you think. Can you help prove this is real or something else? 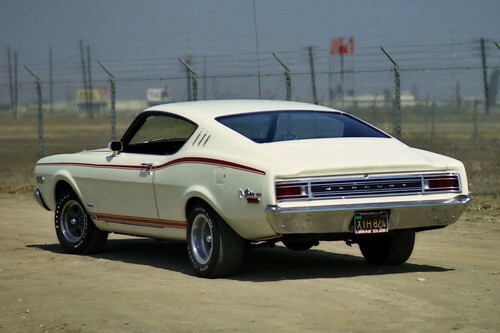 The 1968 Mercury Cyclone GT 500 is not a car that is going to jump out at you and say “Hey, I am something different pay attention!”. It will easily pass for a regular Cyclone GT. However, take a close look at the rear quarter panel emblem and you will see that it consists of the regular “Cyclone” script emblem plus a “500” emblem and a “Flag” emblem. The “500” emblem is from a 1968 Galaxie 500 and the “flag” is from a 1964 Mercury Cyclone Comet. That is the only physical identification I know of at the present time. So what is a GT 500? As best as can be determined at the current time is that they were regional sales promotional cars tied to the “Drive-away” program. An owner would buy a new Cyclone and take delivery at a race track and make a lap of the track just before the race. The first such program appears to have been done in conjunction with the Atlanta 500 on March 31, 1968. These appear to be mostly white cars but are referred to in publications of the time as “Montego Cyclone 500s”. Is it possible that some of these cars were not GT versions of the Cyclone? It was published that 160 such cars were produced. The second set of GT 500s appear to be built in early to mid May of 1968 for the Charlotte World 600. Seems strange to have a GT 500 commemorative car for a 600 mile race but let’s not be too picky. There were far fewer, possibly as few as 60, of these cars built and most of these were Calypsol Coral (orange). Were there others done for other events? Did dealer make there own up? Marti Reports show a GT 500 option on the report so they were built at the factory and not simply a dealer add on. I have seen Marti Reports for the orange cars but none for the white cars. However, I have seen discrepancies in Marti Reports and what follows may be another. Here are some of the Best Photos we have found. These photos were provided by K. Peppers. Tommy Hussey has a white GT 500, or does he? I recently received a phone call from Tommy regarding his white 1968 Cyclone GT that he purchased from the original owner. The owner swears the car had never been modified since she owned it. Tommy has since repainted the car and added some NASCAR decals but states he has not otherwise modified the car AND it has both the Cyclone and GT 500 emblems including the flags. However, when he had a Marti Report completed for the car it came back without listing the GT 500 option. Does he have a GT 500 or not? We need more evidence to figure this one out. The car was built on March 3, 1968. This is the same month as the Atlanta Race on March 31, 1968 when the first dealer promotion was held. (Read the articles much further down on this page regarding that race and the Ford World report.) Most of those cars were white. Tommy’s car is a 302; rumor has it that the white cars were 302s and the orange cars were the 390 and 428 CJs. It is also worth a note that the Ford World report refers to the cars as Mercury Montego Cyclone 500s and not as GT 500s as the later option was called. The cars I have found with the GT 500 option were all built in a small cluster of cars in early May of 1968 just prior to their appearance at the Charlotte race in late May. So the question remains; is this a GT 500? Is it a dealer built car? Does anyone know how the 160 promotional cars for the 1968 Atlanta race were built? Were they something the factory did based on some special order or were these cars simply Cyclones with emblems added by a dealer or the factory? The search for information goes on. If you have any additional insight please send us an email or leave a comment below. You should also compare the photo here with the ones of the Hans Melin white car below. His car also has the emblems but he sold the car many years ago and no longer has the VIN info. In the August 1968 issue of Motor Trend you can read the mention of the special Cyclones for the Atlanta Race. They even mention Cale Yarborough as having won the race. You should also note that Mercury wished to duplicate this slick promotion for the Charlotte World 600 and it appears they did just that. The next image is the bottom piece of Steve’s Cyclone’s build sheet. Notice it starts off with Charlotte 600. Steve states that the Cyclone never had a hood stripe, but notice the word hood is spelled hpod. He believes the assembly line guys got confused and left it off. Steve has talked to the original owner, and he said the hood stripe was never on the car. In the 3rd document, Steve has provided a copy of a Build Sheet for a Cyclone that was for sale a few years ago. The seller sent him the Build Sheet and Marti Report. The gentleman selling it stated that it was 1 of 14 built for the race. The image is very poor but hope you can make out the important information. One of our regular visitors and contributors to this site. John Drilling, provided us with a newspaper advertisement for the GT 500 dated Friday, April 5, 1968. The newspaper is the Herald Journal of Spartenburg, SC. This ad describes the Montego Cyclone 500 (note they don’t call it a Cyclone GT 500) in some detail. It includes a 390 GT engine, performance handling package, blacked out grill, dual body tape stripes, GT Turbine Wheels Covers, CYCLONE 500 IDENTIFICATION, 390 GT Engine Plaque and BUCKET SEAT interior in black or parchment trim with CORAL EXTERIOR PAINT, CHECKERED FLAG VICTORY PLAQUE. What is never mentioned in the ad is the transmission. This ad may substantiate the idea that the white 500 cars were not GTs and that the orange cars were GT 500s. So, if this is correct the Bayless Mercury dealer was advertising a car that was delivered as one of the Cyclone 500 cars from the Atlanta Race. How about the 428 CJ cars? Here is proof of the VIN over stamping on the 1968 “R” Code Cyclone GT 500. In 1968 the 428 cj engine was not available in the Cyclones the entire year. In fact the “R” code designation does not even show up in some data code books for the Cyclone in 1968. What you see below are photos of a GT 500 that has been authenticated with a Marti Report as a “R” Code. I have provided VIN, Data Plate and Inner Fender Stampings photos. I have purposely not included the entire VIN for obvious reasons. Look closely and you can see how the factory, not having an “R” stamping for the VIN actually modified a “F” with some form of over stamp to make it an “R”. The Data Plate is a ordinary “R” stamp. On the inner fenders the location where the “R” should be in the sequence is left blank. On one fender some previous owner scratched an “R” into the blank spot. At the bottom in the circle is an enlargement of the “R” in the VIN to assist you in seeing the over stamp. You can see that the “F” portion is obviously a deeper stamp than the remainder of the “R”. I would love to see some other owners “stampings” to help the non-believers see the light. Thanks to Hans Melin of CA we have some additional information to consider. 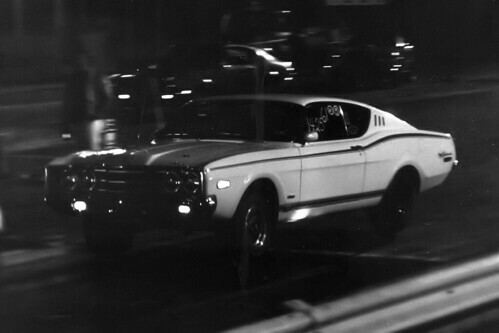 He once owned a 1968 Wimbledon White Cyclone GT 500. He was the second owner and purchased it in the early 70s in original condition. It had a 390 and all the appropriate flag and 500 badges. Since he no longer owns the car or have the VIN and Marti Reports we can not document it but we do have vintage photos which indeed show what looks like the proper emblems. This car was sold new in Santa Ana, CA a long distance from the Atlanta Region that was believed responsible for these cars. However, it is possible that it was delivered to CA. This does tend to support the idea of multiple special promotional cars for 1968. 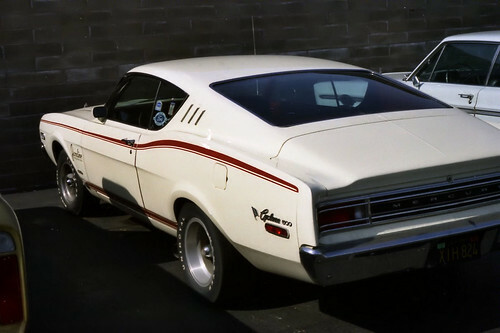 Hans also sent us some additional information regarding his 1968 Mercury Cyclone GT 500 in White! From the lettering on the front fender in one photo you can see that this 390 did some track time. It was part of the Wilson Ford Drag Club! Here is another recent photo of a 1968 Cyclone GT 500 discovered in a back yard. It is a 428 CJ! The black stripes on the hood ARE NOT ORIGIMNAL. 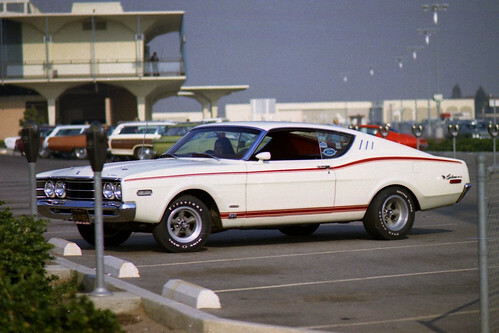 Marvin Speaks and others have suggested that the reason some of the GT 500s have white stripes and others have black is that the 302, 351 and 390 cars all had white stripes and the 428 CJ cars had black. Others have said the 390 cars also had black stripes. Makes sense to me but can anyone confirm this with a Marti Report or other documentation? 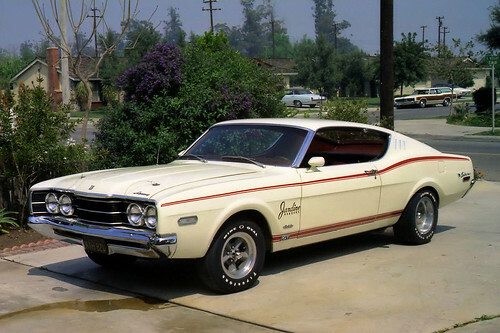 Marvin said he bought a 390 GT 500 in May of 1968 and it had the white stripes. John Drilling from Wisconsin provided these two images. As you can clearly see, this NASCAR program is from the 1968 Carolina 500 held on June 16, 1968. Inside this program is the attached ad for the Cyclone GT 500. You can clearly read the text on this ad. This ad suggests that the cars may have also been built for the Carolina 500 held in Rockingham North Carolina. Or, they may have just been trying to sell off unsold cars prepared for the previous event. As further evidence, John also provided the following two additional items. The first is a letter from Ford to “All Mercury Dealers” and describes a Promotion held in conjunction with the Atlanta 500 race held on March 31, 1968. It was part of a “Drive-Away Program where the new owners took delivery of their new Mercury Cyclones at the Atlanta 500 and got a lap around the track (see second image below). You will note that most of these cars appear to be white with a few painted orange. You will also note that there were 160 cars built but they are not called GT 500s! They are called Montego or Cyclone 500s. This helps clear up some of the confusion from folks who claim to have white GT 500s and those with the 302 engine. This was likely the very first batch of GT 500s built. Does anyone have additional information on the Atlanta 500 program and those 160 cars? Anyone have an Atlanta 500 promotion car? Were there any other similar promotions at other race tracks that anyone has evidence of? You guys (and gals) are the best. You have given us more and better information than I have been able to get on any forum! Fellow car enthusiasts keep emailing and calling. With every phone call and every new email we learn a little bit more about these rare cars from 1968. Muscle Cars are a lot of fun to play with but the detective work it takes to learn about them is also a great deal of fun. Keep looking and letting me know what you find out. It has been stated that the checkered flag cam from a 64 Comet – part number C3MB16188A C3MB16189A. The part number for the 500 emblem is C8AB – 82290098 – A and it looks like a 68 Galaxy. An advertisement from the Southern 5oo program provides additional insight into the standard equipment and it can only be assumed that all regular options could be added to the car from there. I stumbled across your website and picked up the thread about the 1968 Cyclone 500 and GT500. I had a ’68 Cyclone with the 428CJ back in the mid 70s. According to the warranty plate in the glove box, it was originally bought by a woman in Fort Ord CA. It was Poppy Red with white vinyl seats, floor shift, and full center console. 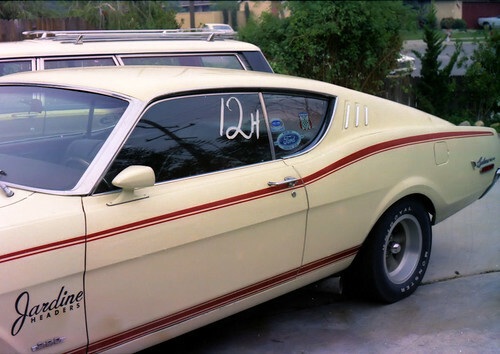 There wasn’t any exterior stripes or emblems on the vehicle- only the 428 emblems on the lower fender panels. The wheels were steel with beauty rings and polished aluminum dog dish center caps. I really loved that car- it was my transportation in college. It would eat Trans Am Firebirds on the interstate. I actually ran a sheriff’s squad car (Mercury Park with a 460PI) and just about pulled in in the upper end. I have been looking out of the corner of my eye for another one- but only a ’68. Thanks for the memories!! I recently came across your web site and I am very impressed with the number of members and nice cars that are still around. 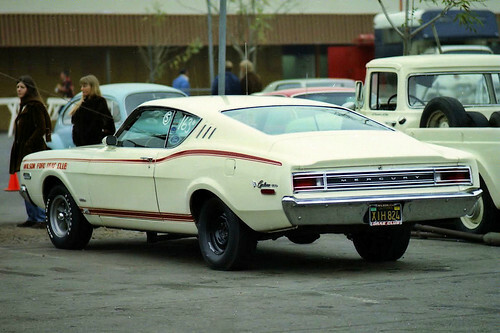 I currently have a 1968 Mercury Cyclone GT (maybe 500) that I have owned for 35 years. I have always been a litle worried about the VIN since the F has been turned into an R on the dash plate but the warranty tag states that it should be an R. I bought the car when I was 15 years old and drove it like a teenager but never tore it up. It has been saved for my todo restoration project but have been tempted several time to cage it and run the #@%& out of it, after finding your site I think I will keep it stock just as it sits. I did some research many years ago and FoMoCo said they never built my car. I think its time for a Marti report. I would attach a picture but not an option with this format. FYI the VIN is 8H15R6081xx body is 63H color # trim *A date 24F D.S.O. 34 axle H trans U. If I recall having the back seat out 20yrs ago it was delivered to a dealer in Indy. Really Great Website!! I know of a 68 J code 4 speed cyclone that has been sitting in a carport since 1978.The guy wont sell it and its not 10 minutes from where I live.Its pretty nice red car with black interior.really cool car.Does anyone know if they made a program shown above for the 1969 race at Atlanta?Did they have the same program for the 1969 season?I have a 69 cale car with 500 badges on the quarters and raised cyclone badges but no flags.This car was last tagged in 1977 so I wouldn’t think anyone would have bothered to phoney it up back then.